1. 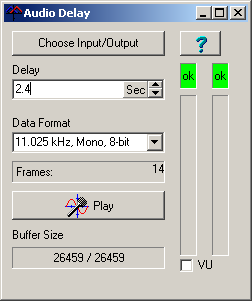 Press the "Choose Input/Output" button in the Audio Delay program. 2. This will take you to the "Sounds and Audio Devices Properties" dialog. Choose the "Audio" page from the tabs along the top. 3. In "Sound Playback" section, choose a default device from the list. This will normally be your sound card. 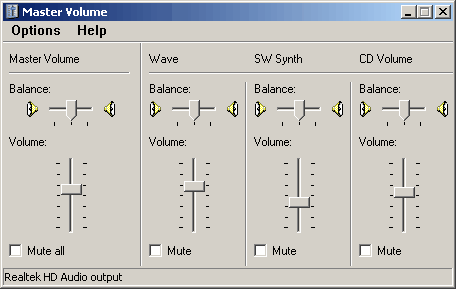 In some instances, like the example above, it doesn't describe the option as a sound card so you may have to refer to your computer documentation to know which device is your sound card. 4. Next press the "Volume" button in the Sound Recording section. This will take you to the "Master Volume Control." The delayed audio will be played back through "Wave" device, so make sure it is not muted and the volume is at least half way up. The Master volume should also be un-muted and the volume should be about half way up. You will probably need to adjust this value later as get everything adjusted. Some sound cards will allow the Line Input to monitored directly and there will be a Line Volume control. If the Line Volume is enabled, this will produce an echo sound as both the delayed and undelayed audio will be played at the same time. If you have this option, make sure it is muted. 5. If the Wave or Master Volume Control sections is missing, select the "Options -> Properties" item from the menu bar. This will bring up the Properties window. 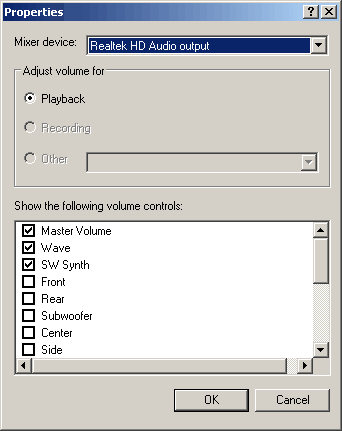 Make sure the Master Volume and Wave options are enabled and press OK. If you still don't have access to the controls you need, you may have to set things up in the Sound Card Configuration utility that came with you sound card. 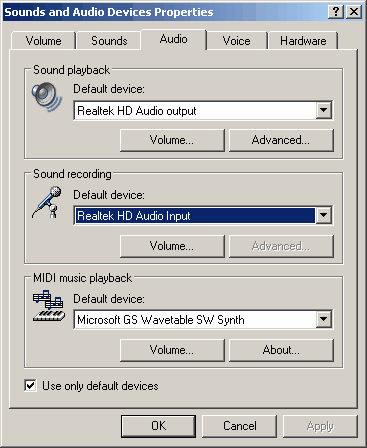 Click here for general information about Sound Card Configuration Utilities. Also, make sure your hardware inputs and outputs are correctly configured.